Air Sealing – Did you know the average home built before 2014 leaks over 70% of its air EVERY HOUR? By properly air sealing and insulating, you make your home much more comfortable, energy-efficient, and save money, too! Air sealing will eliminate a large amount of air that escapes from your home in places you can’t see. By air-sealing and insulating first, before you invest in other improvements, you will make your home more comfortable and reduce your utility bills for years to come. And, dollar for dollar air-sealing and insulating generally will produce a more noticeable improvement in comfort and a higher Return-On-Investment than any other upgrade you could make. If you want to learn more go to Energy Star. Other than spray foam insulation, most other types of insulation, especially fiberglass, are not a sealant and most insulation can’t work effectively with air flowing through it. Stopping air leaks is as critical or even more critical than insulating. Massive air leaks in the attic and insufficient attic and wall insulation is typically a primary cause of an uncomfortable home with high heating and cooling costs. Air leakage, occurs when outside air enters a house uncontrollably through cracks, gaps, and openings. Most homes have the equivalent of a large open window in combined air leaks in their attic alone! Many air leaks and drafts are easy to find because they are easy to feel — like those around windows and doors. But holes hidden in attics, basements, and crawlspaces are more difficult and a bigger problem. Home Performance Services are experts at finding and fixing air leaks and insulation problems in homes and buildings throughout Kansas City using high-tech Blower Door (air leakage) testing and Infrared Thermal Cameras to visually identify air leaks. The picture with blue, yellow and red is from an infrared camera. Blue areas are cold air and yellow and red areas are warmer air. This particular image was taken in the winter which illustrates how cold air is leaking into the structure from the outside. That cold air makes rooms colder and the furnace run more to compensate for the cold surfaces such as walls, floors and ceilings. 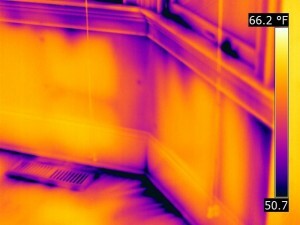 Home Performance Services can provide Thermal Camera inspections of your home or provide a more detailed Home Energy Analysis before you spend money on “trying” one improvement or another. 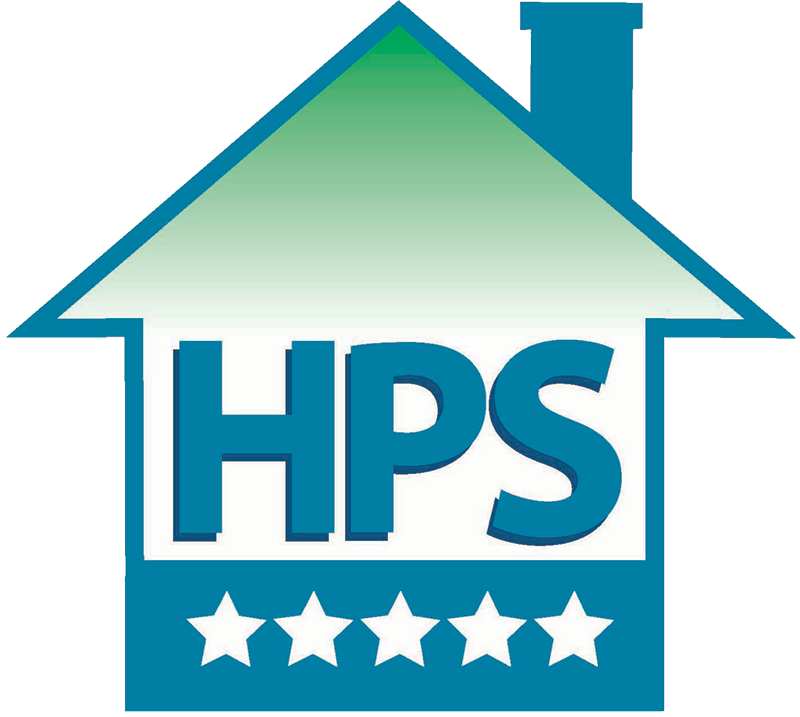 To learn more about home of building air sealing, give us a call now at 816-746-0002 or 913-708-8888.